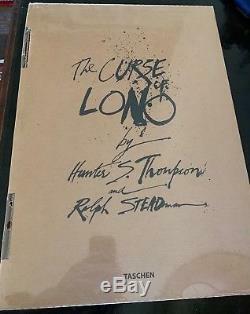 The Curse of Lono - Hunter S. Thompson & Ralph Steadman-SIGNED-TASCHEN #419/1000. 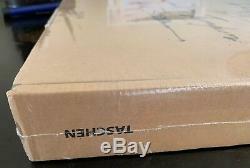 Sealed-- The shrink wrap has a small tear--- see photos for details. 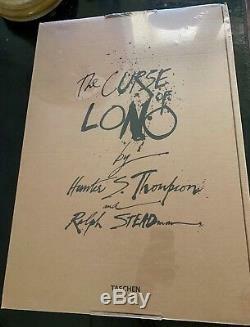 The item "The Curse of Lono Hunter S. Thompson & Ralph Steadman-Signed-Taschen-#419/1000" is in sale since Monday, October 29, 2018. This item is in the category "Books\Fiction & Literature". The seller is "fashioncheque" and is located in Los Angeles, California. This item can be shipped to United States, Canada, United Kingdom, Denmark, Romania, Slovakia, Bulgaria, Czech republic, Finland, Hungary, Latvia, Lithuania, Malta, Estonia, Australia, Greece, Portugal, Cyprus, Slovenia, Japan, China, Sweden, South Korea, Indonesia, Taiwan, South africa, Thailand, Belgium, France, Hong Kong, Ireland, Netherlands, Poland, Spain, Italy, Germany, Austria, Bahamas, Israel, Mexico, New Zealand, Singapore, Switzerland, Norway, Saudi arabia, Ukraine, United arab emirates, Qatar, Kuwait, Bahrain, Croatia, Malaysia, Brazil, Chile, Colombia, Costa rica, Panama, Trinidad and tobago, Guatemala, Honduras, Jamaica, Barbados, Bangladesh, Bermuda, Brunei darussalam, Bolivia, Ecuador, Egypt, Gibraltar, Guadeloupe, Iceland, Jordan, Cambodia, Cayman islands, Sri lanka, Luxembourg, Macao, Martinique, Maldives, Nicaragua, Oman, Peru, Pakistan, Paraguay, Reunion, Viet nam, Uruguay.